I wanted to share this super cute engagement photo shoot in NYC's Central Park. I love the bright colors the couple wore, I think it makes their photos pop! And the location always makes for such lovely pictures. Are you planning to have engagement pictures taken? Where are you going? In conclusion to Las Vegas destination wedding inspiration week, we wanted to share one last but one of the most important wedding details: wedding dresses! All of these dresses are so beautiful, chic, elegant and completely perfect for a destination wedding in Vegas!! So ladies, let us know, which vegas wedding dress do you love? One of my favorite parts of a wedding are seeing the beautiful cakes...and tasting them too! Featuring bakeries and cake designers from both NYC and Las Vegas, these glamorous wedding cakes would be perfect for a Vegas destination wedding. I love how elegant the red roses look, but I also love the ivory cake with the flower crystals, so classy and luxurious! What do you think? In continuation of destination wedding inspiration, featuring Las Vegas, we wanted to share with you a shopping guide including bridesmaid dresses, table setting ideas, fun wedding favors, gorgeous jewelry, makeup and more! Using red, gold and black color inspiration paired with a masquerade theme, shop Lela's Look to help recreate your own glamorous Las Vegas destination wedding! Check out the Medea vodka bottles, you can personalize them by creating your own custom message! Such a neat idea for wedding favors or just as decoration. 3. Linen Swatches via Resource One Inc. In light of our Las Vegas wedding inspiration, we are sharing with you Vegas wedding shoes! So, which Vegas wedding shoe are you? For the next few weeks we will be sharing with you destination wedding inspiration, featuring real destination weddings, color inspiration, perfect wedding shoes and wedding dresses for the different destinations, fabulous cakes and shopping guides to help you recreate the look! This week we will start by sharing a destination wedding from Las Vegas! This real Las Vegas wedding was shot by the incredible wedding photographer Trent Black at the Aria Hotel. I love the reds, golds and black that were used in the wedding decor! The red roses and crystals make such a beautiful bouquet and look at the red crystals around the cake! What do you think? 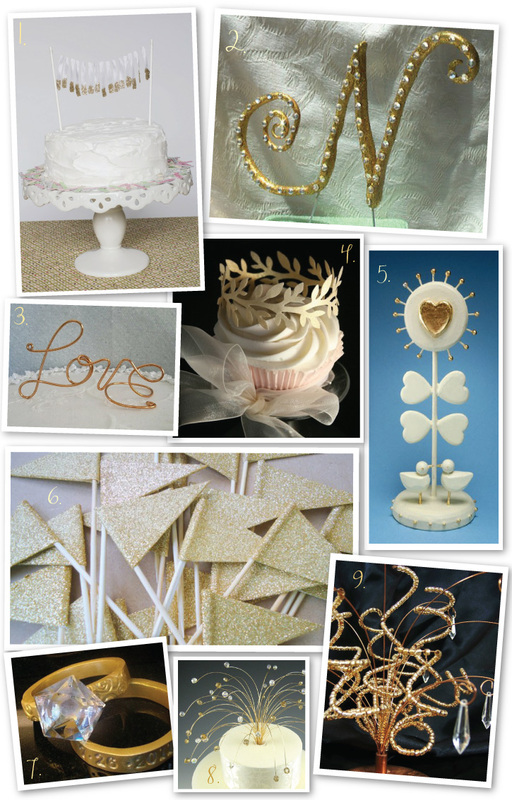 Gold and Ivory Wedding Color Inspiration | Unique Cake Toppers! We are sharing with you one last detail dealing with gold and ivory wedding color inspiration...unique wedding cake toppers! I love all of these beautiful, gold and glittery toppers, especially the monogram with the added bling and the lovebirds, so cute! Which one is your favorite? Shop Lela's look and recreate the gold and ivory wedding color inspiration for your own special day! 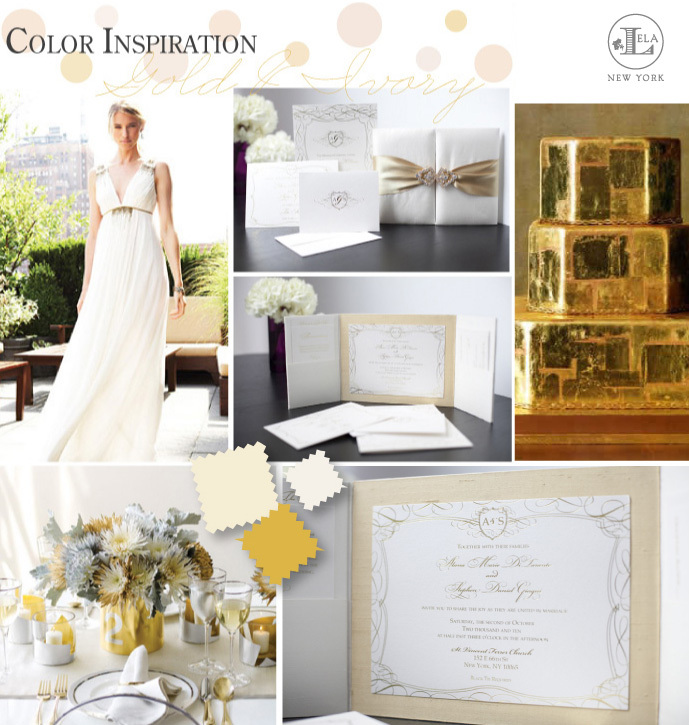 Today we want to share gold and ivory wedding color inspiration, again inspired by Lela New York luxury wedding invitations. This is a beautiful and elegant color theme. I love the gold wedding cake! 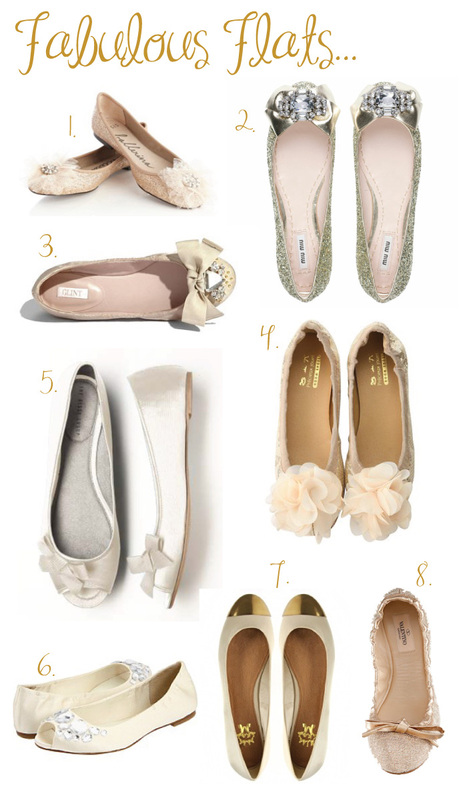 Alright ladies, get ready to ditch the stilettos for a pair of fabulous wedding flats. They are a great idea for both the bride or bridal party, and I am sure your feet will be thanking you all night long!! Which style best fits you? Vintage inspired with lace, embellished with crystals or flowers, or simple and chic? Let us know what you think! Pink and Black Wedding Inspiration | Inspired by Lela New York Wedding Invitations | Plus Shopping Guide! This week we will be sharing with you different color palettes to help inspire you while planning your wedding! Today we will share with you pink and black. This color inspiration has sparked from one of our very own invitations! This particular color theme is very light, airy and classic. Paired with a bolder pink makes for a fun and exciting accent color. Also, check out the shopping guide to help recreate this color theme for your own wedding! 13. Bracelets via Tiffany & Co. So we just featured this amazing celebrity designer, Aruna Seth, in a recent post and now look! A trunk show is coming! Luck you! Meet the amazing British footwear designer, Aruna Seth, and see her fabulous new collection of bridal and evening footwear. Aruna will be at the salon for one day only! Enjoy a special 10% trunk show discount all day! In continuation of celebrity wedding inspiration, we want to share with you another style. 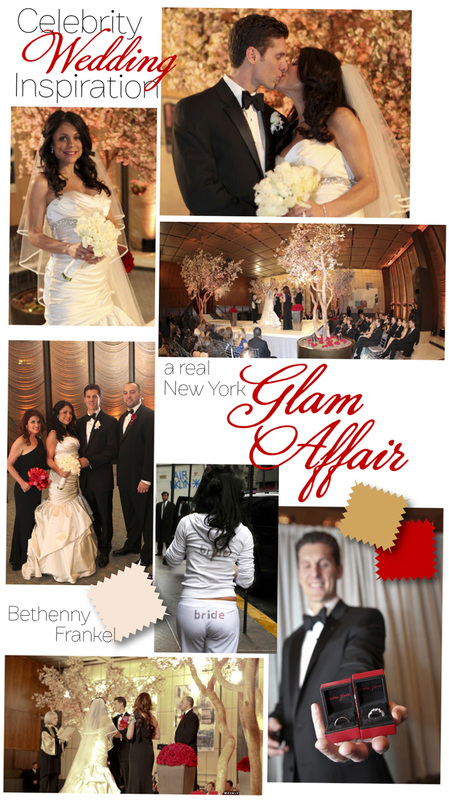 Next is Bethenny Frankel's New York Glam Affair! The Real New York Housewife tied the knot last March to Jason Hoppy in NYC's Four Seasons Hotel. 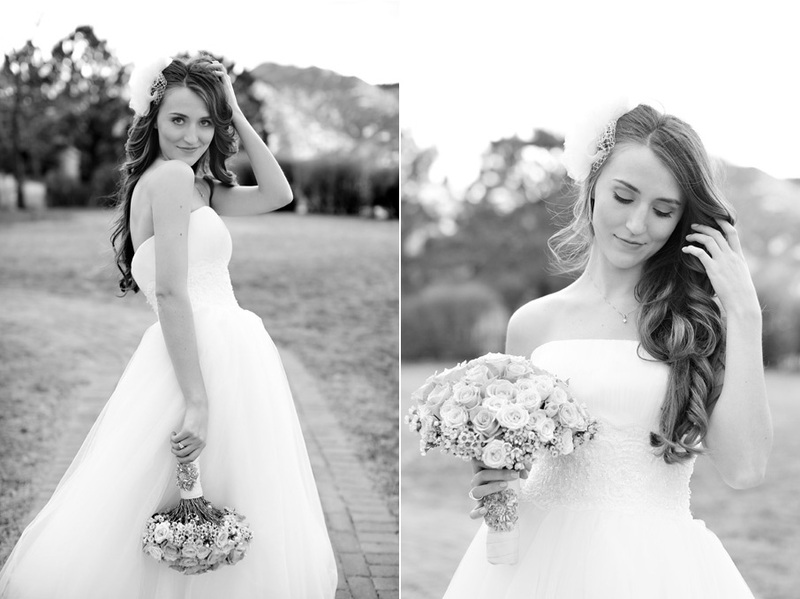 Frankel walked down the aisle in a beautiful and very glamorous Amsale wedding gown. I love the red and black wedding theme and the wedding decor, especially all the red roses! Today we also wanted to let you know about the Wedding Salon, a wedding event showcase that is taking place in NYC's Capitale this July 20th. This is the big one and Lela New York is giving away 10 free tickets, valued at $50/each! We are also offering all our readers a promo code for $15 tickets. 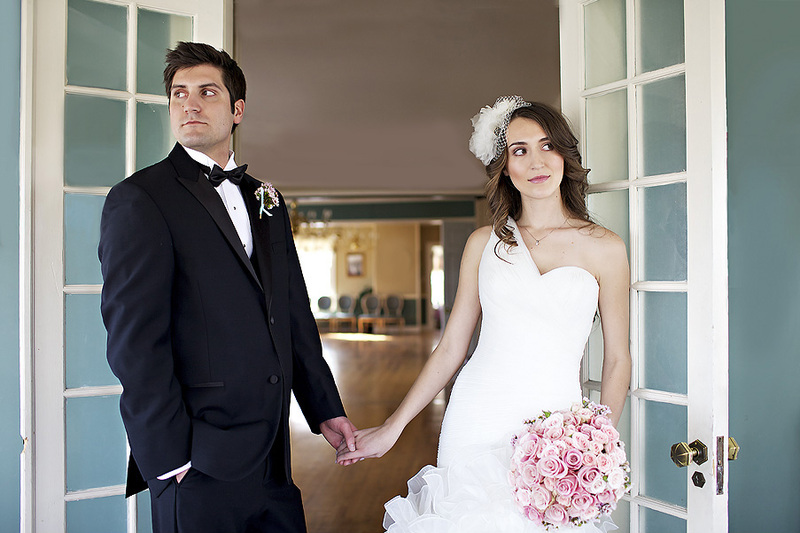 To receive the discounted $15 promo tickets (originally $50) just visit www.weddingsalon.com and enter WSBP as your promo code. To ENTER the free giveaway is easy too! - Comment on this blog post below and make sure to leave your email address so we can contact you if you win! - DEADLINE to enter is July 16th!! - Ten random winners will be announced on July 18th. 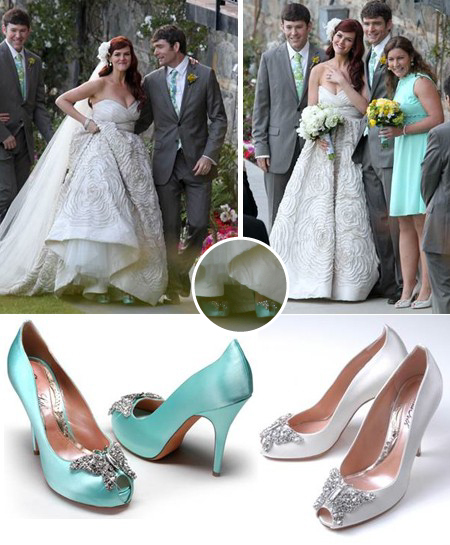 This is such a beautiful "Tiffany Blue" wedding shoe by Aruna Seth worn by actress Sara Rue. The shoe is embellished with the signature Swarovski crystal butterfly. So pretty! This week we are bringing you celebrity wedding inspiration as we review the celebrity wedding styles from this past wedding season, starting with Kate Moss's and her vintage fairytale wedding. Notice the shimmery gold detail at the bottom of her dress, it is so beautiful! I love the colors in this wedding, her veil and the whimsical hair wreaths the bridal party and flower girls are wearing! Let us know which wedding best reflects your wedding style? See the elegant and glamourous collection! Special pricing will be offered throughout the weekend. This is such a charming, bright and summery engagement shoot shot by Alexandra Meseke in New York City's Central Park. I love that they included their dog! Peggy & Chris, both from New York, met several years ago while in medical school, but only connected several years later, when they were called to see the same patient in the hospital. Through a series of unintentional events, including Chris "pocket-dialing" Peggy numerous times, they decided to try their luck at love. Just a couple years later, Chris proposed to Peggy under the stars in Hawaii. Cleverly, Chris snuck in his own telescope that when looked into, the "stars" spelled "Will You Marry Me?". Of course Peggy said "Yes! ", just as a shooting star shot across the sky! 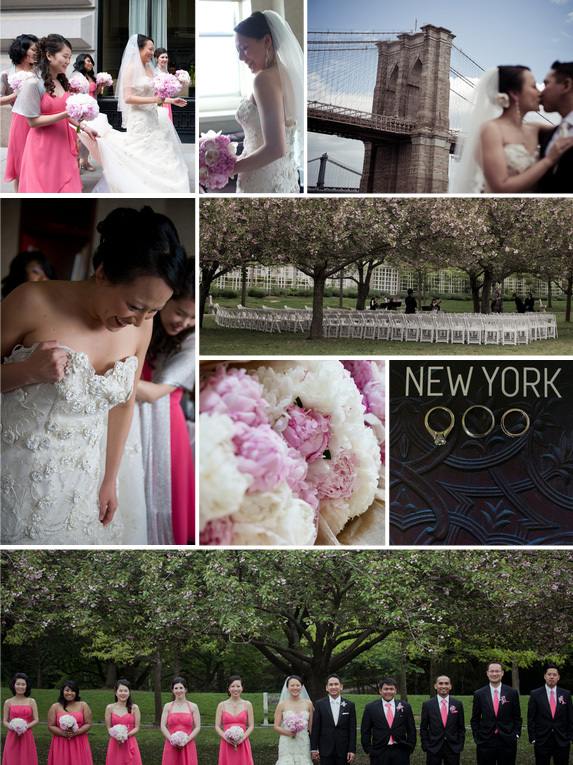 This is such a beautiful wedding taken place at the Brooklyn Botanical Garden. 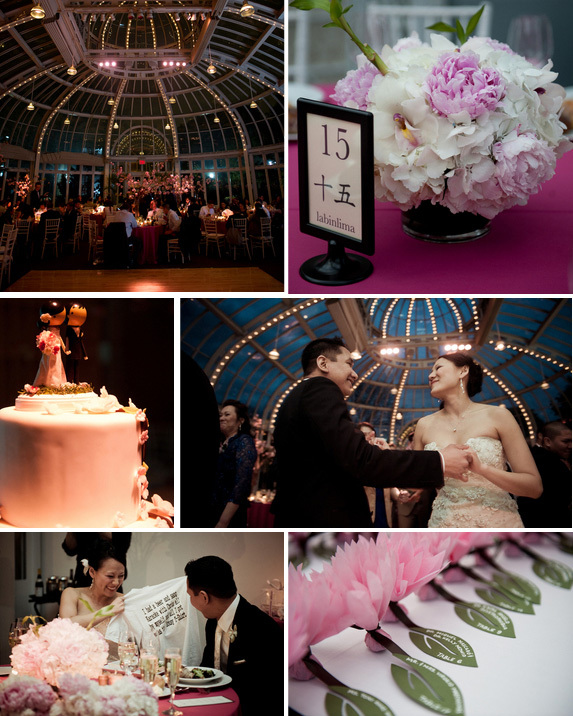 The colors are extremely light and airy and complement the venue and the time of year very well. I also love the fun details of the cake topper and the table numbers and place cards! We are so excited to announce our newest giveaway! 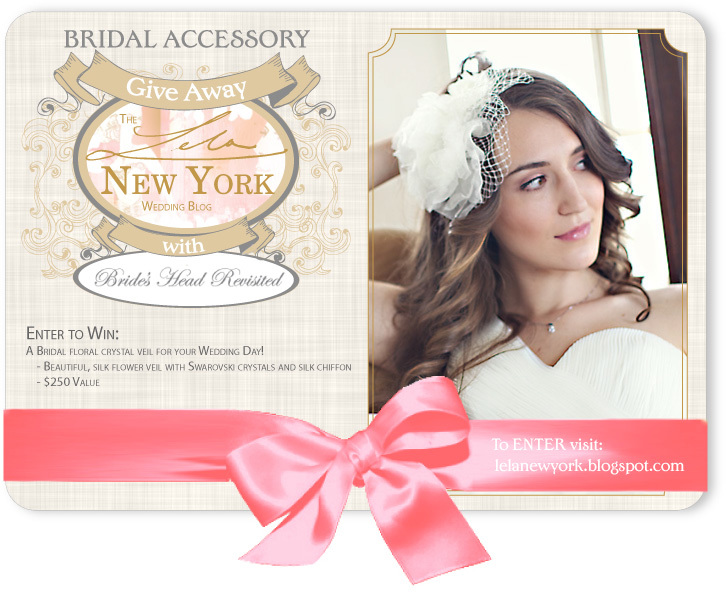 Lela New York and Bride's Head Revisited have teamed up to give away a gorgeous crystal, floral bridal veil worth $250. How exciting?! Please feel free to repost and grab our giveaway badge! Emily and Alex have combined their love for history and passion for contemporary design to create the very glamourous and chic collections of Bride's Head Revisited. 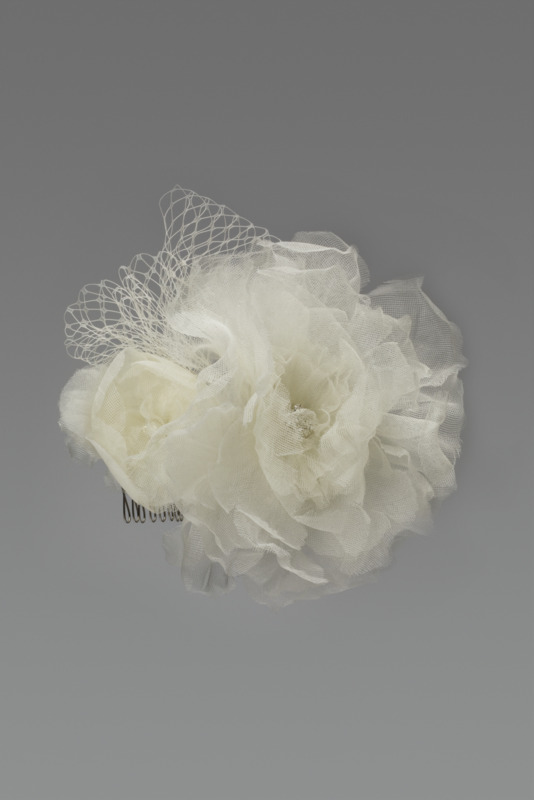 These two strive to make every bride feel special on their wedding day by designing couture bridal accessories to match each style and personality! Here are a few more pictures of the particular piece featured in the giveaway. - Comment on this blog post below and make sure to leave your email address so we can contact you if you win! Also, let us know if you prefer ivory or white in your comment. DEADLINE to enter is July 21st!! One random winner will be announced July 22nd. 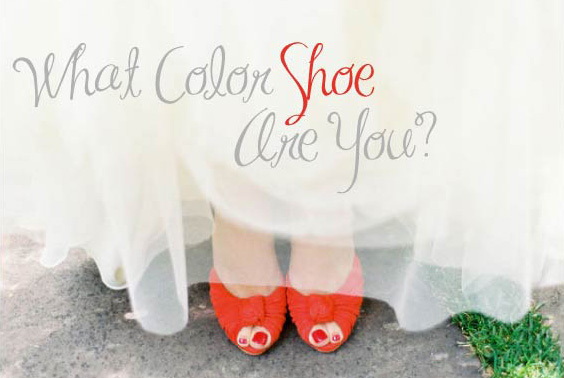 Tuesday Shoe Day | What Color Wedding Shoe Are You? In contiunation of the rainbow trend from last week, we are bringing you more color, glitz and glamour with another shopping guide! Brides are expressing their individuality and personality by pairing a colored shoe with the traditional, classic white wedding gown. So the question is ladies, what color shoe are you?